If you’ve ever wiggled a balloon against your hair, you know that rubbing together two different materials can generate static electricity. But rubbing bits of the same material can create static, too. Now, researchers have shot down a decades-old idea of how that same-stuff static comes about. The same-material phenomenon produces important real-world effects, such as generating lightening in volcanic eruptions, gumming up the processing of powders in manufacturing, and causing explosions in grain elevators. Physicists thought they understood what was going on, but suddenly "the dominant theory appears to be dead," says Troy Shinbrot, an applied physicist at Rutgers University, New Brunswick, in New Jersey who was not involved in the new work. The balloon trick involves rubbing two different insulating materials—your hair and the latex of the balloon—that hold on to electric charges with different strengths. So more positive electric charge builds up on one and more negative charge collects on the other. Like charges repel one another, which explains why your hair then stands on end. You might think that rubbing pieces of the same material wouldn't create static, as they hold charges with the same strength. But charging can happen if the pieces are of different sizes. In 1986, John Lowell and William Truscott of the University of Manchester Institute of Science and Technology in the United Kingdom explained how that might work. They imagined rubbing a small insulating sphere across a plane of the same material, which stands in for a large object. They assumed that the two surfaces were speckled with energetic electrons trapped at random spots, presumably because they had been kicked out of their usual lower energy niches within the material. When surfaces touch, the negatively charged electrons can jump from their high-energy perches on one surface to low-energy states on the other. If equal numbers of electrons hopped in both directions, nothing much would change. But that's where the size difference comes in. As Lowell and Truscott explained it, only one point of the sphere touches the plane, and it has just a few electrons to give and a larger number of empty states with which to absorb them. In contrast, a larger streak of the plane comes in contact with the sphere, so it has plenty of electrons to give. So more electrons hop from plane to sphere than vice versa, leaving the sphere negatively charged and the plane positively charged and creating the static. Other researchers showed how the theory could apply to grains of two different sizes. Unfortunately, the theory doesn't work, report Heinrich Jaeger, a physicist at the University of Chicago in Illinois, and colleagues. They mixed grains of insulating zirconium dioxide-silicate with diameters of 251 micrometers and 326 micrometers and dropped them through a horizontal electric field, which pushed positively charged particles one way and negatively charged particles the other. They tracked tens of thousands of particles—by dropping an $85,000 high-speed camera alongside them. (See video above.) Sure enough, the smaller ones tended to be charged negatively and the larger ones positively, each accumulating 2 million charges on average. Then the researchers probed whether those charges could come from electrons already trapped on the grains' surfaces. They gently heated fresh grains to liberate the trapped electrons and let them "relax" back into less energetic states. As an electron undergoes such a transition, it emits a photon. So by counting photons, the researchers could tally the trapped electrons. "It's pretty amazing to me that they count every electron on a particle," Shinbrot says. The tally showed that the beads start out with far too few trapped electrons to explain the static buildup, Jaeger says. In fact, even if the researchers try to make trapped electrons boil up to the surface by exposing the grains to light, the density of trapped electrons remains less than 1/100,000 of what would be needed to explain the effect, the researchers report in a paper in press at Physical Review Letters. "They show pretty convincingly that the idea of the transfer of these trapped electrons is not valid," says Daniel Lacks, a chemical engineer at Case Western Reserve University in Cleveland, Ohio, who applied the Lowell and Truscott theory to granular materials. If the grains aren't swapping electrons, then where do the charges come from? They could come from hydroxide ions in a layer of water a molecule thick that inevitably coats the grains, Jaeger speculates. Or the charging could involve the transfer of the zirconium material from grain to grain, notes Keith Forward, a chemical engineer at California State Polytechnic University, Pomona. Chromium6 wrote: Unfortunately, the theory doesn't work, report Heinrich Jaeger, a physicist at the University of Chicago in Illinois, and colleagues. They mixed grains of insulating zirconium dioxide-silicate with diameters of 251 micrometers and 326 micrometers and dropped them through a horizontal electric field, which pushed positively charged particles one way and negatively charged particles the other. They tracked tens of thousands of particles—by dropping an $85,000 high-speed camera alongside them. (See video above.) Sure enough, the smaller ones tended to be charged negatively and the larger ones positively, each accumulating 2 million charges on average. Meteorologists have the same problem, trying to figure out how thunderstorms get electrified. Clearly it happens because of collisions between ice particles, because these show up nicely on radar, so we know where they are, and this is precisely where the powerful electric fields develop (which are also detectable using the more advanced radars), and where lightning eventually occurs. The problem is that calling it triboelectricity breaks the rules, since it's collisions of similar particles (i.e., ice). And you can't get triboelectricity by rubbing two ice cubes together. The key is the external electric field. This polarizes the particles, with two implications. First, it increases the chance of collision, since particles are showing opposite charges to each other, producing an electrostatic attraction. So the statistical prediction of the number of collisions will be wrong if it doesn't take that mutual attraction into account. 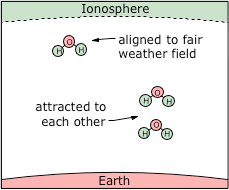 Dipolar water molecules get aligned by the fair weather field, and then are attracted to each other. Green = positive; red = negative. The second implication is that there can be electron transfer in the collisions. Charge separation occurs on particle collision. Note that with heavier particles getting negatively charged, leaving positively charged ice particles higher in the cloud, the storm-generated electric field has the same polarity as the fair weather field (positive over negative). So the fair weather field polarizes the particles, enabling charge separation, which increases the electric field, which polarizes the particles even more. This is how a thunderstorm can generate >2 MV/m, starting with just 100 V/m, in less than 20 minutes. Great Tornado Book! Wow. That looks like a very thorough book you've written there http://vixra.org/pdf/1401.0133v1.pdf. I only read the Prevention section toward the end and the captions of some of the Figures, but that's enough to conclude that it looks like a very valuable book that residents and public officials throughout tornado-prone parts of the world should know about and act upon. You need to start a bad weather work group at QDL. I could help invite the right people to join the group etc. Tornado Fighter Teams. Your solution of shooting wires by rocket up into tornado producing clouds as they approach populated areas sounds very interesting. I read about the scientist in Florida a couple or so years ago who did that just for research purposes. The problem of needing to avoid planes that may be flying in clouds where rocket wires need to go might have other solutions besides contacting Air Traffic Control. Maybe IR cameras or others could see through such clouds from the ground so that the local team of tornado fighters would be able to see if any planes are potentially in the rocket path. And what about sending up balloons with wires attached? Lloyd wrote: That looks like a very thorough book you've written there http://vixra.org/pdf/1401.0133v1.pdf. Lloyd wrote: Maybe IR cameras or others could see through such clouds from the ground so that the local team of tornado fighters would be able to see if any planes are potentially in the rocket path. That's interesting. Air traffic is a very real concern, since the only place that tornado fighting makes sense is where there are lots of people, and that's where there are airports. If there is a confirmed tornado, the planes will generally stay away from it, but there isn't always somebody there to confirm it, especially at night, or if it's a high-precipitation supercell, like they get in the Deep South. Commercial jets also have transponders, but I guess that gear picking up those signals would only give you the azimuth, which doesn't tell you the distance. But an IR camera would show you the size of the target, so you might have something there. What energy beam could ionize air to allow lightning to follow it down? Sparky wrote: What energy beam could ionize air to allow lightning to follow it down? Are you talking to me? Anyway, if you are, to my knowledge, there isn't any -- it's just a Townsend avalanche (i.e., a dark discharge) that graduates to an arc discharge, if the field exceeds the breakdown voltage. Mainstream scientists talk about cosmic rays, and/or solar wind, as initiating the ionization that blazes the trails for lightning. But that's just because they don't understand lightning, and like all scientists these days, they prefer an explanation that sounds exotic, instead of actually approaching the unknowns head-on. Then laser beams wouldn't ionize a path for lightning either, Charles? Lloyd wrote: Then laser beams wouldn't ionize a path for lightning either, Charles? Well, there's a theory that such could work. I don't know if anybody has ever tried it. But I'm saying that unless somebody artificially creates a pilot channel, there's no reason to believe that one will form naturally, except at the breakdown voltage, by the well known arc discharge process. Okay! Thanks, guys.... We have some pretty violent storms here and my new laser pointer should test your idea... I may become the modern Ben Franklen!!!! Your tombstone will read, "Here lies a fellow they called Sparky. Guess how he died." It's nice to read about a number of additional possible solutions. Lasers. Here's also some more info on lasers and weather. Could clouds be zapped by laser to stop it raining? - In a study published in the Proceedings of the National Academy of Sciences, they reported: ‘Under conditions typical for thin cirrus ice clouds, the plasma channels [laser] induced a surprisingly strong effect of ice multiplication. - Within a few minutes, the laser action led to a strong enhancement of the total ice particle number density in the chamber by up to a factor of 100. - The solution? Surround the beam with a second beam to act as an energy reservoir, sustaining the central beam to greater distances than previously possible. The secondary “dress” beam refuels and helps prevent the dissipation of the high-intensity primary beam, which on its own would break down quickly. So Charles what do you think about this paper by Mathis? He's pointing towards his charge field over ice-crystals. Chromium6 wrote: So Charles what do you think about this paper by Mathis? Chromium6 wrote: Then there is this as well -- so are we looking at the same thing here on earth as on other planets? The article explicitly stated that thunderstorm electrification is like rubbing a balloon on your hair (i.e., triboelectric charging). Now, when you rub two ice cubes together, how do they get on different sides of the triboelectric series, so that they can get charged up? Calling it triboelectricity doesn't explain it -- it just obfuscates one's understanding of triboelectricity. Anyway, they did say that the electrification on Venus is probably a different mechanism. But simply put, they don't understand any of these mechanisms. Cheap coating helps electric charge to dissipate from plastics and rubber. It might be called a shock finding. Coating plastic or rubber materials with antioxidants such as vitamin E stops static charge from building up on the polymer’s surface, chemists report today1. The discovery could prove a cheap solution to problems such as dust clinging to plastic, static electric shocks, or the sparks that damage television circuits and fry computer motherboards. Children can have fun with static electricity — when they rub balloons on their hair, the rubber and hair stick together because of the attraction between transferred charged particles. But static charge that builds up on industrial components, such as plastic fuel filters on cars or inside semiconductor parts, can lead to potentially dangerous electric sparks and a build-up of dust. The puzzle with static electricity, explains Bartosz Grzybowski, a physical chemist at Northwestern University in Evanston, Illinois, is that although charged particles should repel each other when they land on an insulating surface, making them spread evenly across a material and leak back into the air, they actually form stable, long-lived clumps. This leads to the build-up of large amounts of tightly confined static charge, enough to abruptly discharge when a conductive path becomes available: for example, shooting through a human body to a metal railing, or sparking through air like a miniature lightning bolt. Grzybowski’s team reports in Science that it has solved the mystery. The researchers examined under the microscope the patterns of electric and magnetic charge created when charged particles land on polymer surfaces. They discovered that charged particles are stabilized by radicals — reactive molecules with spare, unbound electrons that form when chemical bonds are broken on a surface. The radicals share some of the burden of the electric charge; without them, charged particles would not be able to clump together so tightly. The answer, the team says, is to apply surface coatings that react chemically with the radicals, mopping them up. Such coatings could include vitamin E, among other cheap, non-toxic antioxidants. Some of these chemicals are in fact already added to the blends from which polymers are made, in order to scavenge the radicals formed when ultra-violet light damages plastic - but haven't been used as antistatic coatings. The researchers proved their case by using solutions of radical scavengers to coat common polymers, such as beads of polystyrene. Sure enough, after being shaken up to gain static charge, the coated beads shed their static electricity within minutes. The scientists also used their anti-static coating to protect a transistor component, showing that it remained undamaged when charged particles were shot at it from an ion gun. “It’s actually quite incredible that the answer is so simple,” says Grzybowski. Other researchers contacted by Nature found the work exciting. The real advance is the insight into the root causes of static electricity, says Michael Dickey, who researches nano-electronics at North Carolina State University in Raleigh. “It is very clever in the simplicity of addressing an old problem,” he adds. Dealing with the effects of static electricity is "a very big problem in industry,” says Fred Roska, a researcher at 3M in Saint Paul, Minnesota. He adds that simply finding ways to supply charged particles that neutralize the static charge building up on polymers during semiconductor manufacturing, for example, is a billion dollar market. Industrial firms also deal with static electricity by modifying the materials they use: either by covering polymers with water or gel coatings through which charge can dissipate, or by inserting conductive strips of metal or carbon nanotube into a polymer blend to provide a path for static charge to fade away. But those solutions involve trade-offs, Grzybowski says, such as making a plastic more conductive, and do not address the underlying cause of the static build-up. And he thinks that the antioxidant coatings will prove a cheaper solution. He says that he has patented the discovery and hopes to license it to companies such as 3M and Dow. Baytekin, H. T., Baytekin, B., Hermans, T. M., Kowalczyk, B. & Grzybowski, B. A. Science 341, 1368–1371 (2013). Department of Chemistry and Department of Chemical and Biological Engineering, Northwestern University, 2145 Sheridan Road, Evanston, IL 60208, USA. When dielectric materials are brought into contact and then separated, they develop static electricity. For centuries, it has been assumed that such contact charging derives from the spatially homogeneous material properties (along the material’s surface) and that within a given pair of materials, one charges uniformly positively and the other negatively. We demonstrate that this picture of contact charging is incorrect. Whereas each contact-electrified piece develops a net charge of either positive or negative polarity, each surface supports a random “mosaic” of oppositely charged regions of nanoscopic dimensions. These mosaics of surface charge have the same topological characteristics for different types of electrified dielectrics and accommodate significantly more charge per unit area than previously thought. A new study has found that the age-old understanding of this everyday phenomenon—one item becoming positively charged while the other becomes uniformly negative—is incorrect. Grzybowski admits it's bizarre to find a huge surprise in a topic that has been studied since Greek polymath Thales of Miletus first rubbed amber on wool in 600 B.C., and found it could then attract light objects like feathers. Leading lights such as Nikola Tesla and Michael Faraday have studied the phenomenon, but they too reached the same conclusion. "One assumption common to all these models is that one material was positively charged, and one negatively charged," Grzybowski says. "This is actually not true." Perhaps we shouldn't be too surprised: Static electricity is a weird phenomenon to begin with, arising from contact between two insulators—materials that don't conduct electricity, but can create it when rubbed together. To test it in the lab, Grzybowski and colleagues used not balloons, but materials like the common polymers PDMS and Teflon. He pressed samples of insulators together before separating them (rubbing them could create more electrification but would make results harder to analyze). He then used Kelvin probe microscopy to measure molecular charges in the material. With this technique, a scientist runs a tiny probe over the microscopic hills and valleys of surfaces, and the probe vibrates differently over differently charged regions, creating a map of the charges. That's how Grzybowski saw that each material had a random patchwork of positive and negative charges, and neither was uniformly charged. In addition, his tests showed that PDMS and Teflon exchange silicon and fluorine atoms upon contact, a more significant transfer of material than ever previously shown. Case Western Reserve University chemical engineer Daniel Lacks says this new understanding is both fascinating and surprisingly practical. For instance, photocopying depends on precisely delivering charges to ink particles so they end up in the right place on the paper. But Lacks recalls several examples of powders becoming unexpectedly charged and exploding during manufacturing, something engineers could hopefully avoid with better knowledge of static electricity. That knowledge could also lead to better industrial coatings, which would help people like the manufacturer of polyethylene that Lacks advises. During the creation of polyethylene, sometimes the particles get unexpectedly charged and stick to the side of the reactor vessel. "Then you have to shut it down and clear out the chunks with chainsaws and blowtorches," he says. Grzybowski's new study also provides new puzzles for scientists to investigate. While the new study overturns some older beliefs about static electricity, it doesn't fully explain how the phenomenon works. "It's a great day when you come to the office and somebody shows you that your beliefs are wrong," UCLA physicist Seth Putterman says. Putterman says one thing that remains unexplained after this new study—and surprises him—is that the geometry of the charge pattern (that map of the different charges) doesn't change significantly as the two statically charged object move together and the charge decreases. To him, this implies that ions that move around easily on an object's surface are not causing static electricity. If they were, they should change the charging pattern that Grzybowski's team saw on the surface, he says. "To me this means you have extra electrons trapped deep inside the material causing the [static electricity], and they can't go walking around the surface as would ions," he says. That's because the electrons are bound up inside the material. Whatever the explanation proves to be, Harvard University chemist Logan McCarty says it's incredible something so common as static electricity remains such a mystery. "It's certainly more complicated than we have naively believed for many years."